Castle Cranshaw, who calls himself Ghost, is an eighth grader who does not have it easy. His father is in prison for shooting at Ghost and his mom during a domestic dispute and his mom struggles to pay the bills while she works at the hospital cafeteria and takes classes toward becoming a nurse. Ghost is constantly being bothered at school about his clothes, and the poor neighborhood he lives in, and he is known for getting into "altercations" with anyone who gives him a hard time. One day, while killing time to avoid going home after school, Ghost comes upon a track practice. Ghost considers himself a basketball player, but the next thing he knows, he's being asked to show off his running skills, and then to join the team, which is called the Defenders. Though Coach makes a lot of demands on Ghost and the other runners on the team, he also begins to look out for Ghost as a friend and mentor. Though Coach's support and attention mean a lot to Ghost, however, it takes a while for him to begin to turn himself around and stop getting into trouble. "Shamika was... big. Like... huge. She had to be almost six feet tall in the seventh grade. And she had a birthmark that covered half her light-skinned face in dark brown, like a comic-book bad guy or something. But Shamika wasn’t a mean girl. She was actually kinda cool. The only problem with her was that she was super silly, and she had a laugh as big as her body. But it was a real laugh. The kind that made her bend over. The kind that Coach was faking when I first met him. So when I sat down in front of her and bumped her desk, knocking one of her pencils on the floor, Shamika leaned over to pick it up, noticing my new and improved sneakers. And then came the thunder. It just came out of nowhere, and once she starts laughing, Shamika can’t stop. And the worst part is that she can sort of pass her laugh around the room to everybody, just because the sound of it is so outrageous. So if she laughs, everybody laughs. Imagine the sound a car makes when it’s trying to start, but can’t. Now, speed that sound up, and and crank the volume high enough to blow out the windows in heaven. That's Shamika's laugh." This is a short description of a minor character, but it paints such a strong, memorable picture, and it highlights exactly why Reynolds is just a great writer. Reynolds also does a great job of making Ghost wholly sympathetic even when he makes poor decisions. Ghost's own descriptions of what happened with his father, and the complicated feelings he has about him are very powerful and honest. The juxtaposition of Ghost's relationship with his dad and his relationships with his mom and his coach are also very effective for helping the reader to understand Ghost's motivations in different situations. There is never a moment where the reader does not wish the best for this character because he is so real, and his emotions are so relatable, even to those who don't face his same struggles. Another thing I appreciate about this book is its brevity. A lot of the older children's books I've been reading lately are lovely, full stories that fit into 175 pages or less. By comparison, many contemporary middle grade novels feel unwieldy and over-written. At just under 200 pages, this book is decidedly neither. It's a compact, well-developed and perfectly structured story that tells just enough and leaves just the right impression. The ending, especially, is very carefully constructed, and I think it hits the exact right note. This book is getting a lot of attention because it helps bring more diversity to children's literature. Many books that do this, however, are praised merely for their diversity, and not for the technical aspects that make a children's book great. 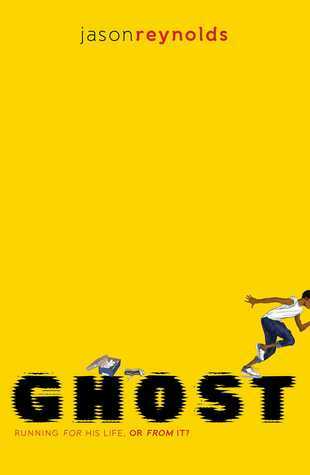 Ghost is a book that deserves critical acclaim because it is an excellent book, and the author is a masterful storyteller. I'd love to see this book win the Newbery, but if it does, I hope it's not because the committee feels it must choose a "diverse" book. I hope it's because committee members see in this book the same things I see: beautiful writing, strong characterization, and universally appealing themes of perseverance and resilience. Ghost is the first book in a series about the members of The Defenders. I eagerly await book two. I agree. I recently read Ghost and just loved him. Well done all the way around. I loved this book. It is actually the only one I have read by him, but I hope to nab him for our next visiting author!